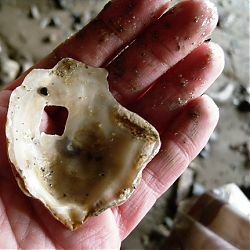 Oyster shells are an extremely common find on archaeological sites of all periods, and are representative of a major food source. The exploitation of oysters has been long established in Britain. There is evidence that oysters were favoured by prehistoric hunter-gatherers, and the first reliable historical references to oyster gathering are from the Roman period; Sallust writing in Rome around 50BC remarked: ‘Poor Britons – there is some good in them after all – they produce an oyster’, while in 60 AD, Juvenal describes the high repute English oysters held with the Roman elite. Oyster beds are recorded in the Domesday Book, and documentary and archaeological evidence demonstrates the continued importance of oysters as a food source through to the Victorian period. For an excellent site-specific study of oyster beds in Emsworth, Sussex check out this article. 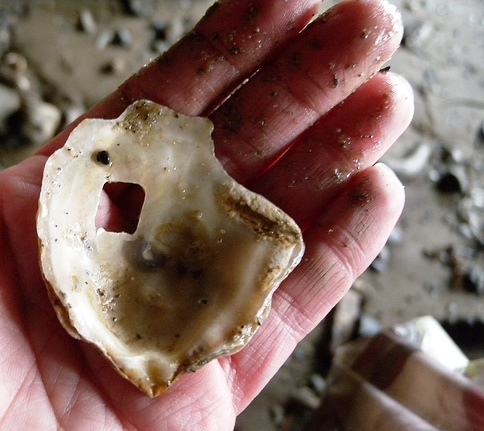 Holes in oyster shells – why?? 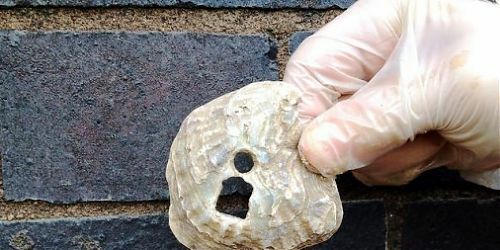 For many, many years now, excavations at sites across England have found oyster shells with perforated holes – some round, some square, and usually with just one hole. As with the unperforated shells, the date range of these artefacts where known is wide-ranging – for example, excavations by MOLA along the Walbrook found holey shells from very secure 1st C Roman deposits, while late medieval examples were recorded during investigations of a deserted village site in Hangleton, Sussex during the 1960s (see Holden, 1963 for a discussion of the oyster shells). 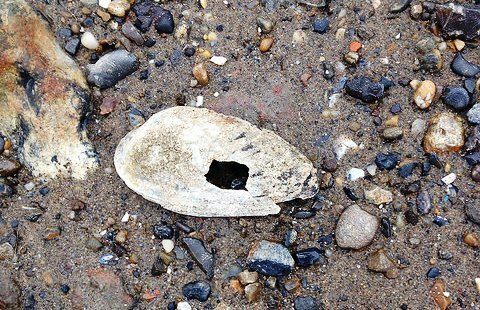 Many of you will have seen examples on the Thames foreshore as well, and now seems to be as good a time as any to pull together a few theories as to why we are finding these! So here goes….. The first suggestion is that these holes could be naturally occurring. They could be caused by birds trying to peck holes in the shells (any ornithologists out there who could confirm or deny this?) or they could be caused by microbes or parasites. For a good discussion of these possibilities, plus the all-important caveat that some holes may have been caused by archaeologists themselves during excavation, have a look at this article. Next suggestion – is it possible that these holes might have been caused during the harvesting process? I’m not an oyster eater myself but I understand that making a hole in the shell might not be a good idea if you want to eat what’s inside it? A third popular theory is that the holes represent evidence for buttons – you could punch out squares and circles as desired. While it may seem wasteful to only get one (or more rarely two) buttons out of one shell, it should be remembered that these are extremely common items, and it simply might not have been necessary to get more than one button out of each shell. 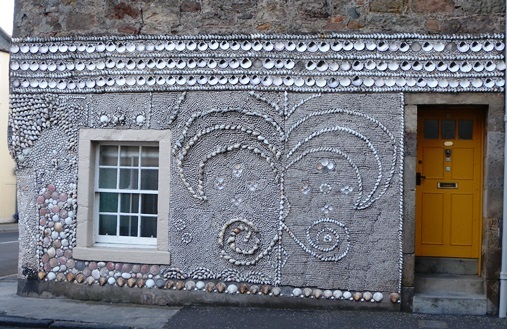 Possibility number four – the shells are being used as building material. Imagine you had a bit of failing wattle and daub, or you needed to patch a hole in your roof – you could hammer in a few oyster shells as temporary protection. 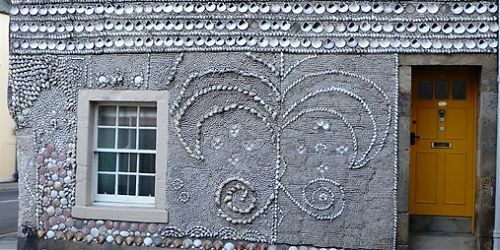 Or perhaps they were being used decoratively – as you can still see in modern examples….It would be interesting to know whether perforated oyster shells are often found associated with other building materials from excavations. And finally, in April this year you may have seen the April Fools Day which suggested that the holey oysters represented an early version of Transport for London’s Oystercard. 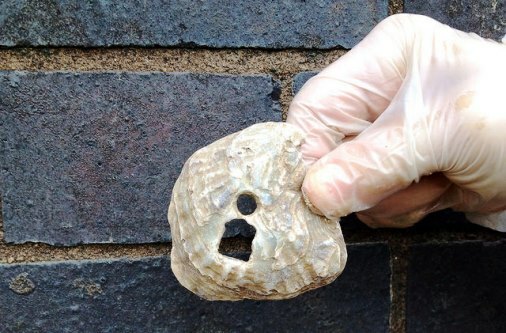 While we certainly can’t say that this is how holey oyster shells were being used, it is worth considering the possibility that they were used as informal tokens of some sort, perhaps for exchange, possibly for gaming or maybe, just maybe as a religious item. The suggestion that shells with holes in them could have functioned as a kind of religious token or badge is a very interesting one. 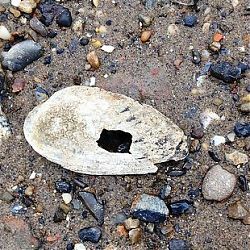 It is well-known that the scallop shell motif was associated by pilgrims with St James of Compostela and as well as the many pewter scallop-shell badges found, excavations at Thames Exchange (TEX88) recorded a scallop shell (Pecten maximus)with holes – these have also been found at other urban sites, including Winchester and Norwich (see Spencer, 2010, 204-5). So is it possible that oyster shells were being used in the same way?? Why not join the discussion on our Facebook group and add your own comments? Going off on a bit of a tangent here but bear with me…. While pearls are most commonly associated with oysters, edible varieties (Ostrea) do not produce them. Freshwater mussels (Unio margaritifera) found in parts of northern and western Britain do however, and these were highly prized from the Roman period and through to the Tudor period as high status items, with symbolic associations to purity and virginity. So maybe we should be keeping an eye out for mussel shells with holes in them being used as religious tokens as well (associated with Mary?) like this one found on the foreshore at Putney earlier this year. For more on pearls see here.